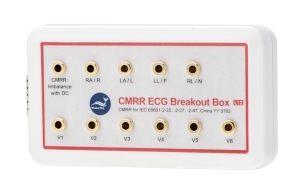 BB-C2 breakout box is designed for CMRR 2.0 to conduct CMRR tests required by medical standards. 9 terminals to be shorted to the inner shield, except RL/N and Imbalance with DC terminal. Comply with CMRR tests of IEC 60601-2-25, IEC 60601-2-27, IEC 60601-2-47 and YY0782.